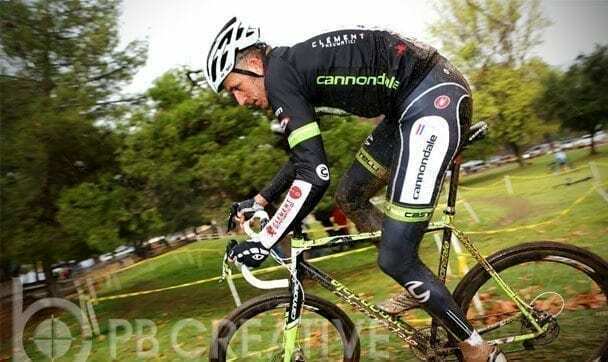 Photos & Report: Trebon & Finchamp Tough it Out at "Cross into 2013" - SoCalCycling.com - Southern California, Cycling, Cycling News, Amgen Tour of California, Bicycle Racing, Fun Rides, Cycling Event Schedules, Mountain Biking, Cyclocross, Cycling Photos, Cycling Videos, Interviews, Product Reviews. Ryan Trebon (Cannondale/Cyclocrossworld.com) and Hannah Rae Finchamp (Cynergy Cycles) overcame a challenging course and even more challenging weather conditions to capture the elite Men’s A and Women’s A classes, respectively, at “Cross Into 2013.” This was the penultimate round of the 2012-13 SoCalCross Prestige Series. 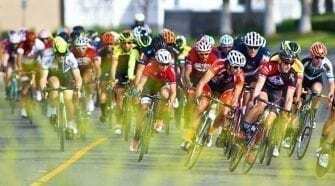 Following a lovely morning of racing at the Baja Beach Club near Irvine Lake, an unexpected thunderstorm passed over early in the Women’s A event with a substantial amount of icy rainfall that would not relent until the final lap of the Men’s A race. 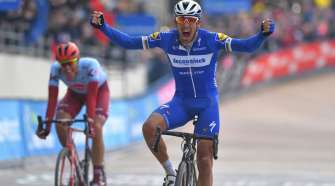 Trebon, a native of Bend, Oregon, visiting Southern California for some “fair weather training,” handled the treacherously slick conditions like the two-time national cyclocross champion he is to win Men’s A by one minute, forty-two seconds. Early leader Brandon Gritters (Rock n’ Road) was runner-up after a two-to-go escape from breakaway partners Aroussen Laflamme (Boulevard Toyota) of Canada and John Bailey (Bailey Bikes), who finished third and fourth. Finchamp started her day with the Junior Women’s 15-18 class victory and then got away from Amanda Schaper (Ritte CX Team) on lap one of Women’s A to score the double with relative ease. Keeping her honest was the surprising Amanda Nauman (Felt), a triathlete competing in her first cyclocross event as a Women’s B class rider.